Mad In India lacks a sense of identity — it’s a poor version of Comedy Nights with Kapil against the backdrop of a David Letterman show. The jokes induced a big yawn, the aam aadmi topic was trapped in boredom, and Sunil Grover’s Chutki versus Gutthi (from Comedy Nights with Kapil) jokes proved to be drab. For a show that had already built a mountain of anticipation, it assembled all the right notes. Dazzling lights; a live band; an audience cheering on overdrive; actor and host Manish Paul who made a flashing entry dancing down the steps to the tunes of the peppy track, Bachna ae haseeno. Star Plus’s new comedy offering, Mad in India 100 % Desi Show kick started with the right amount of energy, but unfortunately the show fizzled out the moment Paul took to the stage, failing to infuse the necessary dose of humour. Having said that, the show lacks a sense of identity — it’s a poor version of Movers & Shakers meets Comedy Nights with Kapil against the backdrop of a David Letterman show — and the producers need to clearly define the fun quotient and entertainment elements. Agreed it’s just one episode old, but the maiden run is what grabs eyeballs. In this case it didn’t. The jokes induced a big yawn, the aam aadmi topic was trapped in boredom, and Sunil Grover’s Chutki versus Gutthi (from Comedy Nights with Kapil) jokes proved to be drab. 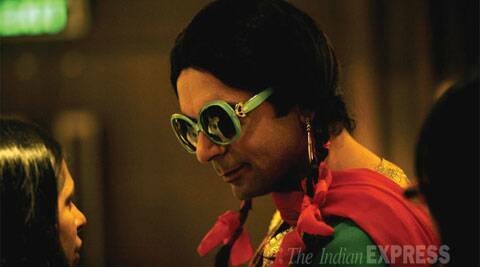 Chutki terribly missed the ‘haazar jawab’ spunky spirit of the mad, mad, Gutthi. Even brilliant veteran performers such as Siddharth Jadhav, Rehman Khan and Dolly Ahluwalia Tewari couldn’t rescue the tiresome and repetitive acts. At one point we wished Paul would stop touching his guest Baba Ramdev’s feet, and repeating, meri mummy kehti hain. Being funny requires a certain degree of seriousness. It is not about slapstick humour and silly jokes all the time. This is a talented bunch of artistes, and one hopes the level of comedy goes up a few notches. The humour needs to be current, sharp, witty and smart. The extra star here is for Baba Ramdev, the debut guest on the show. He cracked the madness meter simply because he made for an unusual interviewee. We felt strangely patriotic when he broke into a song with Aye watan tere liye. It’s a start, and the show still has many Sundays to go. We have our hopes pinned on the next episode with actors Govinda and Karisma Kapoor.